If you read my blog you’ll know I’m a big believer in marketing your screenplays aggressively. 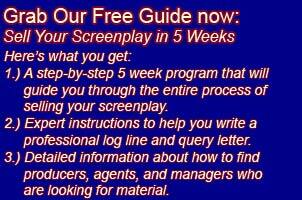 Sending out lots of query letters is one of the keys to succeeding as a screenwriter. In fact, I believe spending time marketing your material is just as important as spending time writing. All the scripts that I have sold and optioned have come from as a result of a query letter. It’s not easy but it does work. I wrote this post Getting your screenplay to producers and production companies which explains how to find companies to send your material to. While finding the information is a good first step, it’s still a lot of work compiling the information into a spreadsheet, creating the letters and then faxing and emailing them out. Over the years I’ve built a large database of agents, managers, and producers and have been using it to promote my own material. I keep this database updated and am constantly adding new contact information to it. I’ve built several time saving tools to access this database so I can send out faxes and emails to my database of contacts with relative ease. So… I’ve decided to open this service up to the readers of Selling Your Screenplay. Agents and managers fax/email blast I have about 500 agents and managers in my database. The membership price for fax / email blasts to agents and managers is $109 per blast. If you’re looking for representation this is the quickest and easiest way to get your material into the hands of agents and managers. Producers and production companies fax/email blast Many new writers assume that getting an agent is the first step to starting a screenwriting career, but I’ve actually found that producers are more open to reading material from new writers than agents are, and in fact all my sales and options have come without any help from an agent or manager. I have about 6000 producers and production companies in my database. The membership price for the fax / email blast to producers and production companies is $159 for the entire blast or (for a limited time) you can purchase 1/3 of the blast for just $53. If you purchase 1/3 of the blast, there is no obligation to purchase the rest of it, this is simply a way for us to allow people to cheaply use the blast and see how powerful it really is without spending a lot of money. My current database is much more than just the stock information out of The Hollywood Creative Directory. I’ve been compiling my database for years and I’m constantly updating it and I have many email and fax numbers that go directly to the decision makers, not just the stock “info@” or “queries@” type email addresses. I’ve also found that doing both a fax blast and an email blast hits most people twice and increases awareness and response to my scripts. I haven’t found any other query service that includes faxing, so it’s a fairly novel way to present a query letter and seems to get a really good rate of response. The prices quoted above include both an email blast and fax blast to all the email addresses and fax numbers we have in our database for that category. When you purchase this service all you will need to do is provide your query letter, I’ll take care of faxing it and emailing it out to my list of contacts. I’ve created a members only screenwriting forum where I will personally critique writer’s log lines, query letters, and synopses. I don’t want to burn my lists by sending out junky query letters so all query letters must be approved first, and the approval process will be online through the members only forum. I’m also going to limit the number of blasts per week, again, so that I don’t burn my list by sending too many query letters to it. Here’s how to sign up: First you sign up for our SYS Select service and you get access to the forum along with a host of other services. Inside the forum you post your log line and query letter. You will get notes on your log line and query letter, and once you’re happy that it’s as good as it can be, you pay for the blasts and it gets blasted out. By submitting your log line and query letter to the forum first, it ensures that there is some standards to the query letters that are sent to my list. Go here to learn more and to sign up: Selling Your Screenplay Select. Next post: How can I attach a director to my screenplay?